The Women Human Rights Defenders International Coalition (WHRDIC) strongly condemns the violent response by the police in light of the protests in Kidapawan City, North Cotabato Province, Philippines. Since March 30, 2016, more than 6,000 farmers from various municipalities of North Cotabato Province have been holding a protest to demand rice subsidies from the government following foot shortages caused by drought. When farmers asked for rice, the government responded with bullets. On April 1 the local governor ordered the police to disperse the barricade, and in the process, police used water cannons, batons, and open fire against the non-violent protestors. The attack led to 2 confirmed dead (one of whom was a woman farmer), over 100 wounded (including children), and many are missing or detained. Among the detained, there are 34 women, 3 of whom are pregnant and 4 of whom are minors. Bai Ali Indayla, Secretary General of KAWAGIB Alliance for the Advancement of Moro Human Rights, was on the frontlines of this barricade as a part of the chief negotiating committee on behalf of the farmers. After the police attack, protesters, including Bai Ali Indayla, sought refuge in the Spottswood, United Methodist Church, Kidapawan City. PNP-Region 12 and other units of state forces surrounded the church and prevented anyone from leaving the church compound. Support groups bringing food were barred and intimidated. Bai Ali was wounded during the violent dispersal, as she was pushed by riot policemen and hit by a water cannon. Karapatan, a human rights organization in the Philippines, of which Bai Ali and her organization KAWAGIB are members, reported that a national fact-finding and humanitarian mission would be conducted April 4-6 on the Kidapawan incident. We call on the government of the Phillipines to provide all necessary conditions for Karapatan to conduct their human rights investigation in a conducive manner, free from harm or hindrance. 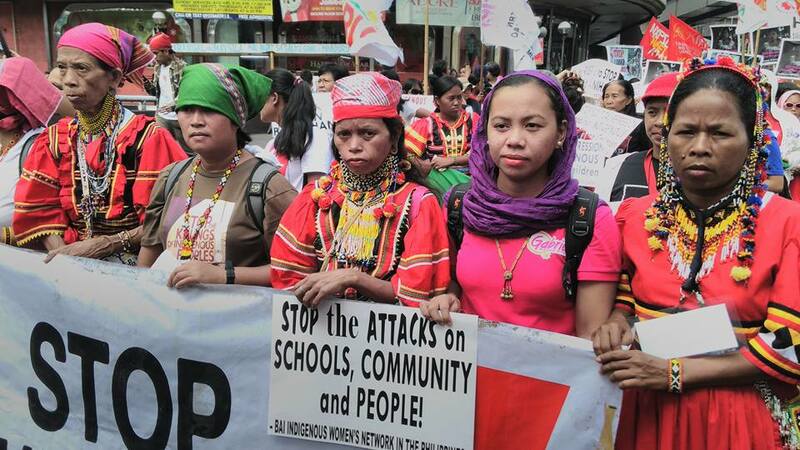 The Women Human Rights Defenders International Coalition condemns the attacks perpetrated by State agents against the farmers, including women and human rights defenders. We call on the Government of the Philippines to end the gross and violent attack of the peaceful protestors. We demand the release of those unlawfully arrested and detained and accountability for the violations perpetrated against the protestors. The Philippines is a notoriously dangerous country for WHRDs defending their land, culture and livelihood. The WHRDIC realizes the meaningful and committed efforts of WHRDs in Philippines in defending their most fundamental rights under extreme risk. We call on our international community to join us in solidarity with these non-violent protestors mobilizing for their fundamental human rights.